It's going to be a long, cold and dark weekend for a lot of people in the Northeast. A massive ice storm has knocked out power to more than a million homes and businesses in seven states. At least one death is being blamed on the storm: New Hampshire officials said a 49-year-old Danville man who lived in a camper died of carbon monoxide poisoning after turning on his generator when his power went out Thursday night. CBS Station WBZ correspondent Karen Anderson reports that states of emergency have been declared in New Hampshire and Massachusetts, allowing National Guard troops to be mobilized to help communities with their recovery efforts. People lost power as far south as Pennsylvania, but most of the outages were in New Hampshire, Massachusetts, Maine and New York. Ice-covered trees cracked and fell on roads and cars. Temperatures dipped into the teens Fahrenheit Friday night and early Saturday in northern New England, forcing many people out of their homes and into shelters. New Hampshire Gov. John Lynch urged residents still without power to make overnight plans early. "I think there were a lot of people who decided to just stick it out and stay home last night hoping that power would be restored today, but I think people have to assume that power will not come back today and seek shelter," Lynch said. Utilities say it will be days before all service is restored. With state officials and power companies saying it might be a week before some New Hampshire residents get their power restored, hundreds of thousands of people spent Saturday figuring out how to keep warm. "I still don't have power. I can't shower, I can't cook, I can't do much of anything," Debbie Reed, 57, of Rochester, said Saturday. She went to the Rochester Middle School shelter Friday afternoon when she started seeing her breath in her apartment. "My plan is to go home and see how long I can stand it. If the power isn't back on by tonight I'll come back here," she said. "It's so cold I can only stand it for so long." Gov. Lynch, who requested a federal emergency declaration in order to receive generators, cots and other supplies from the government, urged residents to check on their neighbors, especially those who are elderly and live alone. "I think there's no substitute for that kind of neighbor-to-neighbor assistance that New Hampshire is traditionally famous for," Lynch said. In Raymond, just about all of the town's 10,000 residents were in the dark following the storm. Fire chief Kevin Pratt said a shelter at the local middle school usually houses 25 people comfortably, but if the need's there, they'll accommodate. Visitors could eat a spaghetti-and-meatball dinner and take a shower. "People's houses are getting cold and they're getting cold," Pratt said. "They're wise." The ice storm compared with some of the Northeast's worst, especially in New Hampshire, where more than half the state - 400,000-plus homes and businesses - was without power. There were far fewer outages during the infamous Ice Storm of '98, when some residents spent more than a week in the dark. "All the motels have no electricity, and that's why I'm here," said Duke Straychan of Hampton, who came to stay overnight at Portsmouth High School. He can't do without power because he uses an oxygen tank at night. People at the shelter dined on American chop suey and shepherd's pie and watched "The Polar Express" in the cafeteria. Hot meals of turkey and mashed potatoes were delivered to people staying at Londonderry High School. There were about 100 visitors with more expected, said Leslie Shaffer, a spokeswoman for the American Red Cross. She believed most would still be there on Saturday. The numbers also were rising at Nashua High School South, as well, as surrounding towns filled up their own shelters, said Mark Sousa, the city's emergency manager. Temperatures topped out in the low 20s Saturday and were forecast to drop to the teens or lower during the night. Across the state, more than 700 people spent Friday night in 46 shelters, and more were expected Saturday. "The first night, your house doesn't get so cold, but the second night - it was 20 degrees last night - so who knows," said Sue Rogers, a nurse volunteer for the Great Bay chapter of the Red Cross. Greg Champlin of the state Office of Emergency Management also expected more people at shelters Saturday night. "It's gonna get really cold tonight. It's really cold out there now. Hopefully, some of the people who shouldn't be staying at home will come to a shelter tonight," he said. Joan Erhard, 72, of Rochester, also went to the Rochester shelter Friday night. Erhard said her Parkinson's disease makes it difficult to get around her apartment and even cook, and aides who help her didn't show because of the storm. She was eager to get home Saturday and see her cats. "I love my home," she said. "My Christmas tree is there and everything." Doug Monkton, 56, of Peterborough, was one of many people searching for emergency generators. "We went to half a dozen stores all the way into Vermont looking for a generator," he said. "We got the last two in Cheshire and Windham (Vt.) counties." Monkton was lucky. A sign at a Home Depot in Keene on Saturday told a familiar story. "Attn: valued customers," it read. "We are currently out of the following: generators and propane heaters, gas cans, inverters, small propane tanks, D batteries, wood pellets. Sorry for the inconvenience." Michelle Plourde, 44, manages a Mr. Mike's convenience store and gas station in Jaffrey that stayed open Friday despite having no power. By Saturday morning, Plourde said the shelves were pretty well depleted. "We'll stay here for people as long as we can," she said. "This is pathetic," said Bob Cott of Portland, Maine, who lost power. "I'm already sick of winter and we have nine days to go before it officially begins." Gov. John Baldacci and Central Maine Power Co. President Sara Burns say it could be well into next week before power is fully restored in Maine. Baldacci and Burns met with police, fire and other officials at a South Portland fire station Saturday morning to discuss restoration efforts. Baldacci said the storm is "kind of a mini version" of the epic ice storm of 1998. A decade ago, the storm was a statewide event with rural areas particularly hard hit; more than 700,000 people were without power. This time, the storm was concentrated in the more heavily populated areas of southern, central and coastal Maine. At the peak, an estimated 550,000 people didn't have electricity. As of Saturday morning, 172,000 homes and businesses in CMP's service area are without power. Burns says the goal is to bring that number down to 100,000 by day's end. She says utility crews from Michigan, New York, New Brunswick and Nova Scotia are on their way to help with the effort. 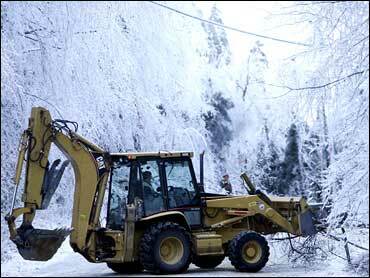 CMP cleared fallen trees and downed lines during the night in preparation for the first full day of repair work. Crews from the Canadian Maritimes are expected to arrive late Saturday, with additional crews from Michigan due on Sunday. CMP says it could be days before everyone has power. Governor Deval Patrick declared a state of emergency Friday morning and called up members of the National Guard. Five hundred Massachusetts Guard members were cleaning up debris and clearing access to downed power lines. Lynch put 150 on alert and deployed 25. "All of the resources at our disposal have been made available to try to get the roads clear and power restored," said Patrick, adding that it would be "ambitious" to think power would be restored by Monday to the 350,000 homes and businesses in his state left in the dark. "This is not going to be a couple of hours," Patrick said. "It's likely to be several days." Work crews were struggling to help restore power to the estimated 350,000 Massachusetts customers who lost electricity in Friday's ice storm. By Saturday morning the number of customers without power had dropped to just over 200,000.
still a long way to go, but work crews hope to make more progress during the day as temperatures slowly inch up. In Methuen, Mass., 40-year-old Itziar Richardson of North Andover was staying at a Red Cross shelter at the Comprehensive Grammar School with her husband and their 2-month-old son. "I'm not having a good day," she said. "It's definitely not the best situation with the baby, but you have to make the best of it." The storm coated a region stretching from the mid-Hudson Valley to the southern Adirondacks with up to a half-inch of ice, felling trees and knocking down power lines. Crews worked through the night to clear roads blocked and downed power lines and were still scrambling on Saturday afternoon. National Grid said at the peak of the storm Friday it had 229,000 customers without power. By Saturday afternoon, crews had restored power to 100,000 of them, said utility spokesman Patrick Stella. Outage updates from Central Hudson Gas & Electric, which had about 50,000 customers without power Friday, and NYSEG, which was reporting about 32,000 outages, were not immediately available. "Things are much better," said Carol Breen, a spokeswoman for the state Department of Transportation. "But there are still trees coming down because of ice on branches; they're heavy and they can break at any point." Vermont electric utilities say that almost 16,000 customers are still without power on Saturday morning following the ice storm that swept the region. The majority of those outages are in Windham County, followed by Windsor and Orange counties. A handful of outages are reported in other parts of the state as well. Route 9 between Brattleboro and Bennington, Vt., a major road, was closed because of downed trees. Four emergency shelters opened Friday at schools in Hartford, Putney, Springfield and Wilmington. The ice storm extended to Pennsylvania, where about 4,700 customers, most of them in the Poconos, lost power, and Connecticut, where some 17,000 customers were without electricity at the height of the storm. Those states mostly got heavy rain or rain changing to snow.